The Native Green Cane Harvester at work. At Dandelion, we use only two ingredients in our bars, but we spend most of our time talking about just one: cocoa beans. It makes sense, beans give us a lot to talk about: flavor, process, environmental impact, the producers we work with, genetics, history, and more. But this year will be different. Recently, Mike Orlando of 24 Blackbirds introduced us to a new organic sugar from Brazil, and we loved it. We loved the taste, did a few tests, and despite the fact that it increased the viscosity of our chocolate, we made the transition. We buy the sugar from something called the Native Green Cane Project through a values-driven import company called Global Organics. A few months ago, Global Organics invited our Chocolate Sourcerer, Greg, on his first visit to the source of the sugar. He met up with Ryan Berk of Parliament Chocolate and our old friend Arcelia Gallardo of Mission Chocolate for a tour of the grounds and process. 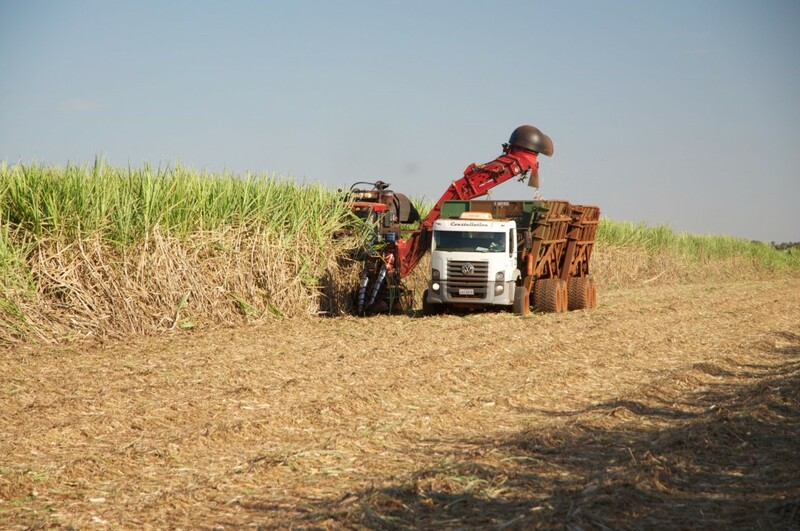 Before long, he came back with a story that floored us all: 350 kilometers northwest of São Paolo, the largest agricultural project in the world is making inspiring headway on a new, sustainable approach to farming sugarcane, and the results are absolutely delicious. The Native Green Cane Project, under the leadership of agronomist Leontino Balbo, is pioneering new methods of cultivating sugarcane by returning the land closer to its natural state. That means nixing the chemicals and methods that deplete the soil and destroy biodiversity in favor of a more natural approach. Typically, sugarcane is harvested by setting fields on fire to burn off the leaves before the cane is slashed down by machete or machine. The Native Green Cane Project designed a green cane harvester that not only harvests the cane without fire, but leaves it to grow back for seven harvests before planting the field again. The project is also entirely self-sustaining—every output is fed back into the process—and produces enough surplus energy to power a city of more than 500,000 nearby. There is so much more to talk about, so we’ve compiled it all under the sugar button in Our Beans & Sugar page. Head on over to read more!